Arts District residents may be joining the shopping cart march into a new Superior Grocer that opened last week at Central and 20th, two blocks south of Washington Blvd. Now they can grab fresh tortillas with their tofu, a reflection of the changing demographics in this part of Downtown. The full service grocery store opened with fanfare as 9th District Councilwoman Jan Perry welcomed the crowd in English and Spanish, and the Manual Arts Band did a circle around the store. The sound of trumpets, drums, and song leaders bouncing off glass cases of frozen food and ice cream. "It's been 5 years form beginning to end, we persevered," said Perry while welcoming shoppers entering the grocery store. "It was tough, with land use issues, sidewalks easements, but it paid off. Here we are with a line of people out the door. That should tell you something." Superior Grocers will cater heavily to the Latino community, and is the main feature of Central Village, a $27.5-million mixed-use development with a total of 45,000 square feet of retail space. Above the store are 85 affordable-housing apartments. It's the first large grocery store to open on the South LA in a number of years, but leads a South L.A. $150-million-plus construction parade. In early 2010, a Fresh & Easy Neighborhood Market––a $32-million development with 18,500 square feet of retail and 79 affordable-housing apartments––will open at Central and East Adams Blvd. In Spring 2010, the $28-million Rittenhouse Square at Central and East 33rd will open with 4,500 square feet of retail space and 100 senior apartments for seniors. Projects at the back of the pack include a $9.3-million early education center and health clinic on East Jefferson Blvd and Central, and a $23-million renovation of a YMCA. Next month a rooftop-garden clad Constituent Service Center will open at Central and East 43rd Street–-which Perry nicknames as a City Hall––that will become a new anchor for the infamous corridor of South Central Ave once known for jazz. Team "Rock out with your Falkor Out!" hit the Red Bull Soapbox ramp. The Red Bull Soapbox Race Los Angeles is Mad Max crashing into the Doo-Dah Parade, as 40 entries competed for speed and creativity in front of 111,000 people. A brain from Cal State Northridge left USC and UCLA in the dust; an homage to Mel Brook's "Space Balls" was a crowd favorite; the entry that had a man stripping on a pole had judges raise the blank side of the scorecard, a non-score. Pics of other moments in the high speed roll in the hay bales are included in the gallery now posted at blogdowntown. Pershing Square at 7pm, just as the Autumn Lights LA 2009 began. Until 1 AM. Pershing Square is Downtown's Night Light as curated by Lilli Muller. A quick session of speed Scrabble with Abode Communities, the Architecture firm sponsoring a Park[ing] Day site in the Arts District, led me to laying down PARKING DAY. They will vouch the play was legit, however, they declined to give me an extra 50 points. Abode Communities were joined by the Kogi Truck and Coolhaus at Traction and Alameda, and the demonstration park will be up until 4pm. ADD: Coolhaus was recently featured in Time Magazine. Gideon Kotzer inside the main office at Crazy Gideon's. More of the visit on video at blogdowntown. 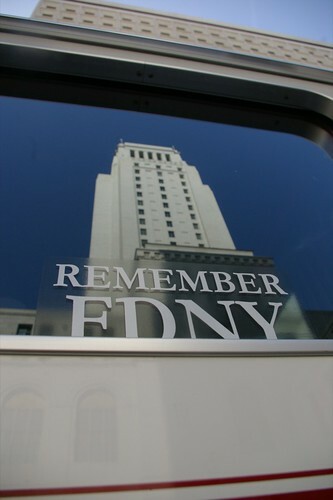 From April 2008: Window reflection from out of town firetruck parked outside memorial services held for LAFD Firefighter Brent Lovrien. AUTUMN LIGHTS LA returns after two years of lights out. Artis/curator Lilli Muller has rounded up artists who work with light as a medium, and the one night festival will make Pershing Square an experimental studio with performance art, installations, and projections. It begins at dusk with artist introductions and music, then as night falls sculptures will be lit, and the parks walls and surrounding downtown buildings will be illuminated. Autumn Lights LA is based on Berlin's “Festival of Lights" and was first held at CalTrans Plaza in 2006 and 2007. Muller's future plans for the festival include extending the night of lights over three days, and later to air real time broadcasts coinciding the festival in Berlin. 6th and Hope on 9/9/09.